As the road construction season kicks off, the Federal Highway Administration is drawing attention to the need to stay mindful of safety when traveling through work zones. 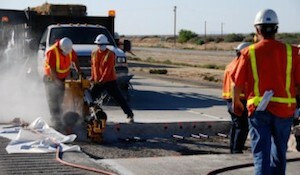 The workers who construct, repair and maintain the nation’s highways perform valuable service that helps motorists travel. Unfortunately, construction workers and motorists are vulnerable to accidents in work zones when drivers are not paying attention or driving too fast for road conditions. According to the Federal Highway Administration, 609 people died in work zone traffic crashes across the United States in 2012. That was an increase of nine deaths from the previous year. Most of those killed were drivers and their passengers in cars. Since 1917, when official record-keeping began, 57 employees of the Georgia Department of Transportation have been killed in accidents in highway work zones. The biggest risk to construction workers in a work zone emerges when motorists fail to reduce their speed or drive inattentively. Notices at the entrance of construction zones warn motorists about the work taking place ahead and alert them to slow down. Many accidents occur because drivers are using their cellphones, fiddling with the radio or talking to passengers. Slow down when you see a notice warning you about construction work zone activity ahead. Maintain those low speeds as you travel through the zone. Do not drop your speeds so low that you are actually blocking traffic behind you. Don’t stop to stare at construction activity or equipment. Driving too slowly can be dangerous. Avoid all forms of distraction while you’re traveling through a work zone. Make sure that your cellphone is switched off, and turn off your radio. Keep conversations with fellow passengers to the minimum, and focus on the task of driving safely through the zone. Don’t tailgate a vehicle n front of you. Maintain an adequate distance between your vehicle and the vehicle ahead. Pay attention to the signs in the construction zone. The signs are in place to help motorists travel safely through the zone. Look out for road crew flaggers who are there to help motorists drive safely through the zone. Highways are worksites for hundreds of workers, who have the right to be safe when they are going about their jobs.